If you have a badly damaged or decayed tooth, you should take care of it before the situation gets worse. At Bradshaw Family Dental, we offer several restorative options to repair damaged teeth. We also specialize in restorations that are only offered by a select number of dentists, known as inlays and onlays. Inlays and onlays are restorations used to repair teeth with mild to moderate decay, cracks, or fractures. Inlays and onlays are also known as indirect fillings because they are fabricated in our dental laboratory and placed at a later date. Most fillings are fabricated chairside. An indirect filling is considered an inlay if it is bonded to the center of the occlusal (bite) surface of a posterior tooth. An indirect filling is considered an onlay if it extends over one or more cusps of a posterior tooth. The inlay and onlay procedure is generally split up into two appointments. During the first appointment, Dr. Andrew Zeiger will begin by administering local anesthetic to numb the area. Next, we will remove any damage or decay with a small drill or file. Then, the tooth will be cleaned and prepared to receive the inlay or onlay. Once the tooth is properly prepared, we will use a dental putty to make a mold or impression of the newly-shaped tooth. This impression will be used to create a three-dimensional model of your tooth. Next, the model will be sent to the dental laboratory, where they will use it to fabricate your final restoration. This process can take two or more weeks to complete. In the meantime, we may give you a temporary restoration to protect the tooth. Once the inlay or onlay is complete, we can schedule your second appointment. During this appointment, we will begin by removing the temporary restoration. Next, we will check the margins of the new inlay or onlay. Once we have achieved the perfect fit, we will permanently bond the restoration to the tooth using a special cement and curing light. 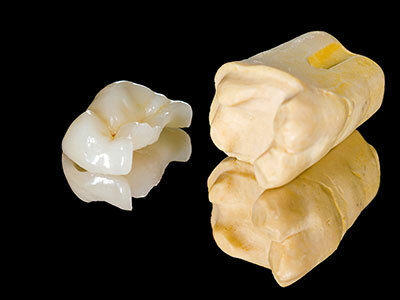 There are several benefits of inlays and onlays over more traditional restorations. For instance, they offer a superior fit that preserves more of the natural tooth structure. They are typically made of porcelain or zirconia, two materials that best match the aesthetics of natural tooth enamel. In fact, your restoration will blend in with your natural tooth and become virtually invisible. They are also easy to clean and maintain. Dental crowns can trap bacteria and cause further issues with decay. Onlays are also ideal for tight space fulfillments, as they are easy to clean, do not stain, and offer superior longevity. If you would like to learn more inlays or onlays, call (928) 277-0076, and schedule your appointment now!